eD@HoMe: An awesome cover from U.S.A.
An awesome cover from U.S.A. 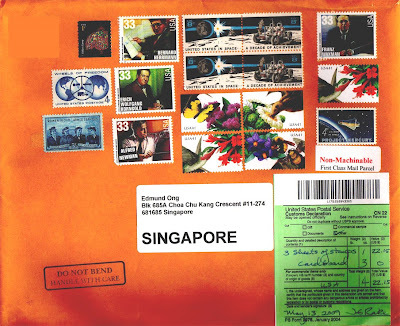 Here is an awesome 17-stamps cover sent from the United States of America by an eBayer. 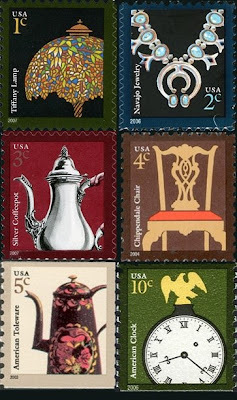 The 1-cent Tiffany lamp stamp franked on the top, left of this cover belongs to the "American Design" definitive series, issued from 2002-2007. As previously described, this series showcases objects from various areas, regions and ethnic cultures that combine utility with beauty and function with form. It replaces the 1981-1995 Transportation definitive series. Next, we have a stamp that is over 48 years old! It was issued on 15 October 1960 from the "Wheels of Freedom" series. The 3-cent stamp franked on this cover belongs to the "Women in Armed Services" series, issued on 11 Sept 1952. It is the first stamp issued by U.S. Postal Service to honor women in the Armed Services. The four 33-cent stamps franked on this lovely cover are part of 6 stamps from the "Hollywood Composers" series, issued on 16 Sept 1999. 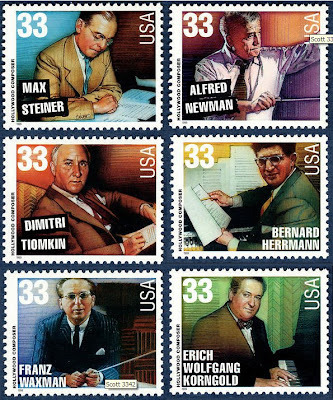 Six distinguished composers, namely Max Steiner, Dimitri Tiomkin, Alfred Newman, Bernard Hermann, Franz Waxman, and Erich Wolfgang Korngold are featured on the pane of six 33-cent stamps. Their dramatic musical scores have made a lasting and indelible contribution to the way Americans see-and hear-motion pictures. 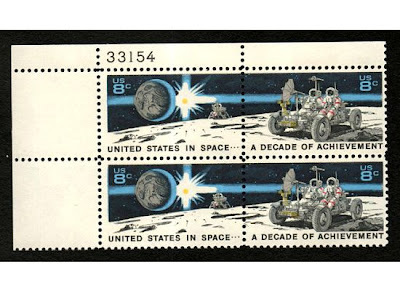 The block of 4 stamps franked in the middle of the cover is from the "United States In Space - A Decade Of Space Achievement" series. They were issued on 2 August 1971. 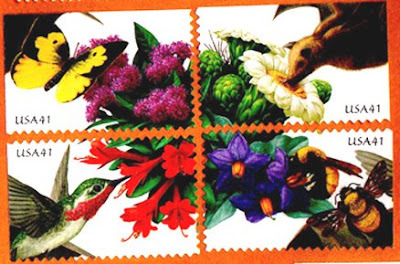 The four colourful stamps depicting Purple nightshade, Hummingbird trumpet, Saguaro, Prairie ironweed (plants & flowers), Morrison's bumblebee, Calliope hummingbird, Lesser long-nosed bat and Southern dogface butterfly (pollinators) belong to the "Pollination" series, issued on 29 June 2007. These stamps emphasizes the ecological relationship between pollinators and plants and the biodiversity necessary to maintain that relationship. The four different stamp designs can be arranged in two alternate blocks that fit together like interlocking puzzles. In one block the pollinators form a central starburst; in the other block the flowers are arranged in the center. 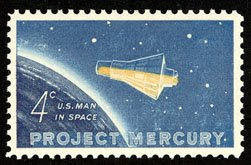 Lastly, is a commerative stamp from the "Project Mercury" series to honor John H. Glenn, Jr on his three orbit flights, in his space capsule "Friendship 7". On 20 Feb 1962. Glenn became the first American to orbit the Earth. This cover took 5 days to travel from Pennsylvania, USA to Singapore. That's all for today! Have a great weekend! 3 lovely covers from Malaysia! A gorgeous cover from Italy! 3 awesome covers for today! A lovely cover from the Philippines! A lovely cover from Turkey! 2 lovely postcards from Poland and Azores! Lovely covers from Slovakia and India! 3 great covers from Malaysia! Another beautiful cover from U.S.A! A lovely cover & postcard from Poland! A lovely cover from Finland! My 2 covers from England! My first cover from Qatar! A lovely cover from Hungary!